It’s got nothing to do with sewing but I have to share it with you! I am back from holiday and want to show you where I was. I used to go there often when I was younger with my parents but I had forgotten how breathtakingly beautiful it is. Robert Stevenson wrote a book of his travel there with a donkey called: “Travel with a donkey in the Cevennes”. 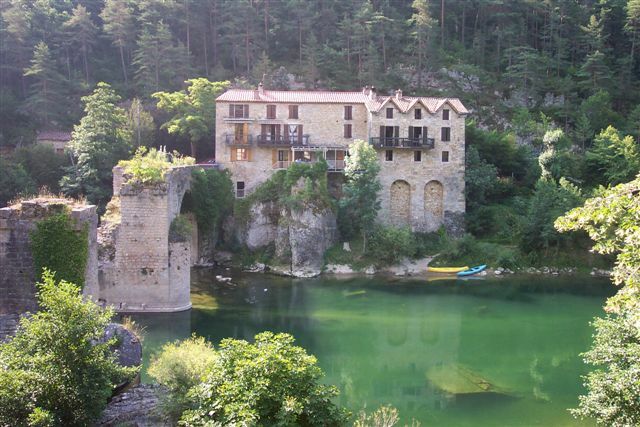 We went to a little town in the Cevennes called Florac in the south of France. We stayed in the VVF where we were warmly welcomed. The holiday village was just what we wanted; nice accommodation, plenty of space for children to play safely, great staff, swimming pool, lots of games to borrow… We were at the bottom of a mountain so the environment was just dreamy. The weather was absolutely fantastic which was a lovely change from all the bad weather we were inflicted. That’s the view we had from the swimming pool….. It was a very active holiday which never happened before with two young children and we really enjoyed it. We went hiking a bit everywhere in the area. there are many different hiking trails and you can find all the maps at the tourism office in Florac. they were really helpful. We chose the small trails walking about 4.5km with the children. They really enjoyed it, holding the map and playing guide. we met shepherds and their herd, horse riders, donkeys…It was a delight and we are now very motivated to go hiking in the English countryside. We also went to a place called “Le Vallon du Villaret”. It’s a massive park in the middle of the forest where the children can enjoy many different activities and art. It was amazing, fun, beautiful and really original. We found lots of different hidden places to go swimming in the Tarn. We bought the kids some fishing nets and that kept them occupied for hours. I just cannot describe the beauty that was surrounding us. One of the most memorable experience we had was when we went canoeing in the Gorges du Tarn. We went with friends we made at the village and we really had a good time, lots of laughing, swimming and paddling! I truly recommend it. We also ate at the best restaurant in Florac called “Cuisine les trois roches” . The tables were rustic and few meaning the atmosphere was relax and intimate. You could also feel that the boss was passionate about healthy organic local good food. It was all about taste and healthy true food. the waitress was lovely and the boss nice but not overwhelming.